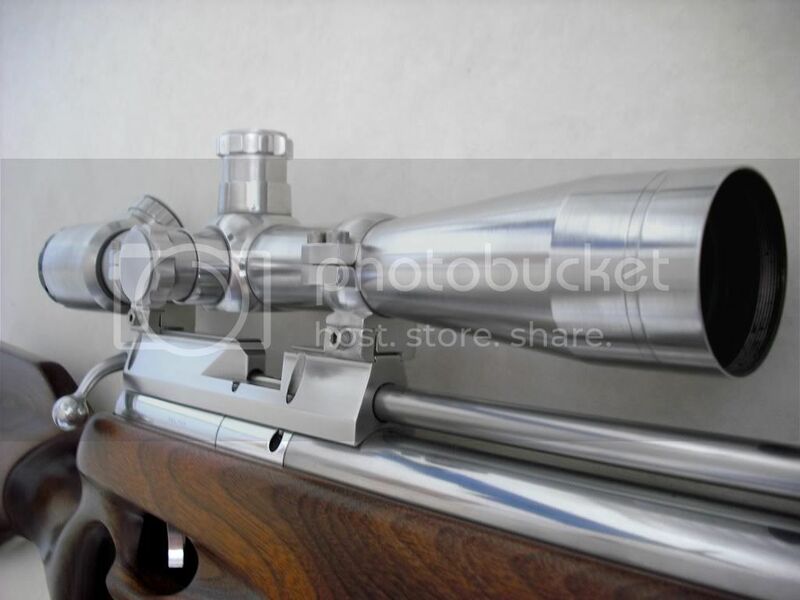 Discussion in 'General Airgun Chat' started by Kingplinker, Aug 2, 2009. Thanks for looking , these are the stocks and mods that will be available direct from our new site which I hope to have up and running asap ! Blimey Dave, truly blingtastic! why wasn't it down at SiHFT today for a debut? You missed a good shoot @ Swallows & Jack scored well also, 54 IIRC. 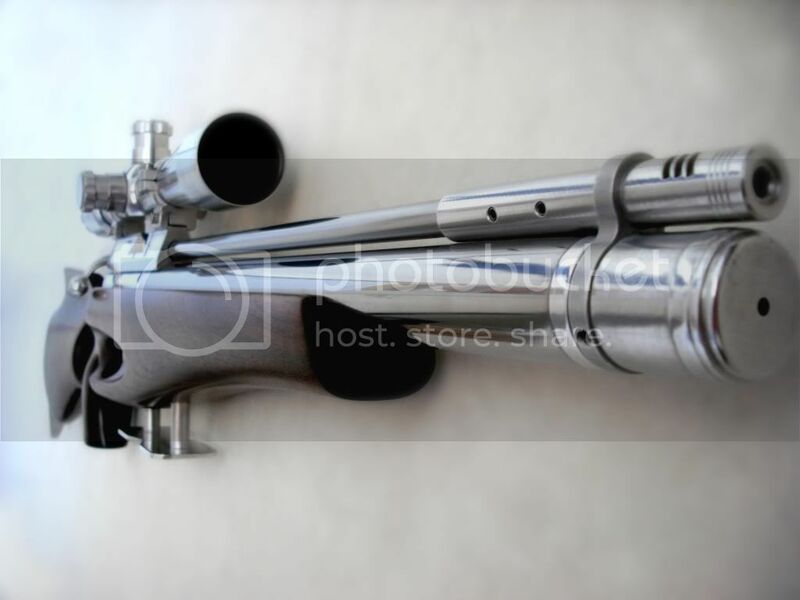 Oh & the gun looks nice, having held the stock it even feels good to a lefty, real nice balance to it. F**k mate, you just made my day, bigtime. I'm totally STUNNED!!!! You are a genius with these things. Are you sure its the same piece of plank I mailed you? Whilst its fair to say I did a fair bit on the stock all credit to James , the bloke is a superb stockmaker IMO. 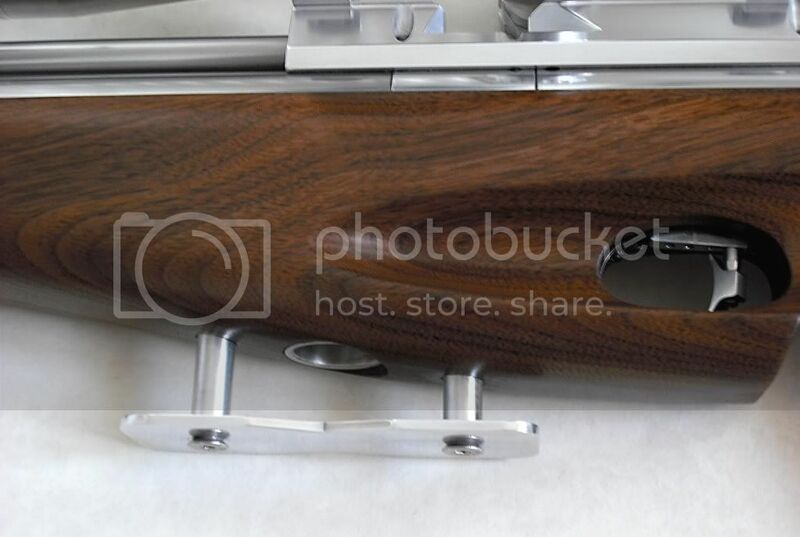 Dave just a suggestion but how about a slither of wood matching the stock shaped and fitted to the hamster, would aesthetically balance it out brilliantly and shouldn't add weight or depth too much. P.S. Steve/Dave can you apologise to Simon for me as I didn't have time to catch up after as Matt needed to get on the road. Fantastic work Dave, I disagree about the hamster, I'd keep it metallic, but maybe a little 'chunkier'? I already have the walnut cut to size , just a slither and thats why its not countersunk as yet but thanks for the input . 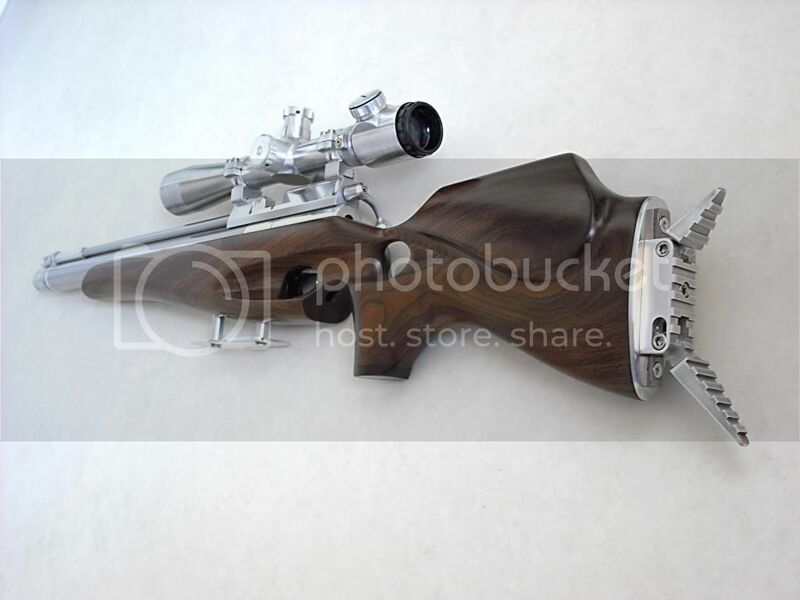 That is just awesome , If you're going to be selling these mods I'd better start saving..
No worries - I always said my guns were marmite guns anyway so each to there own and all that . Cracking job there Dave and Simon and everyone else involved, stunning piece of work! p.s. 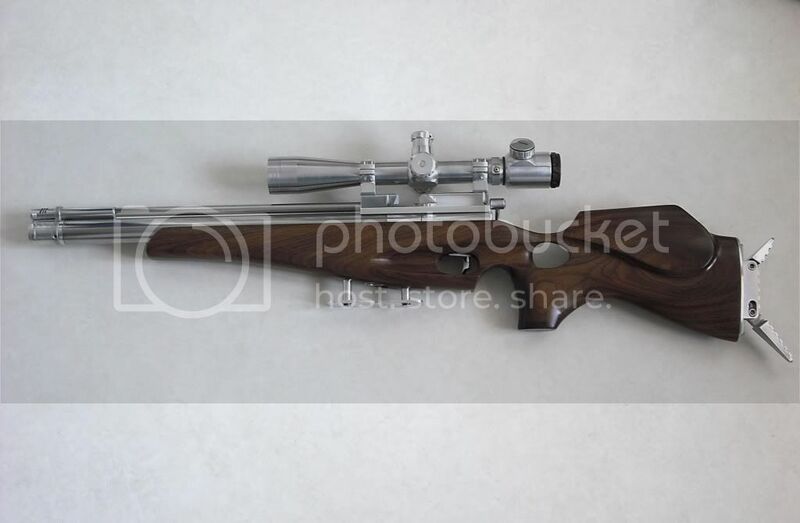 that stock suitable for a springer? 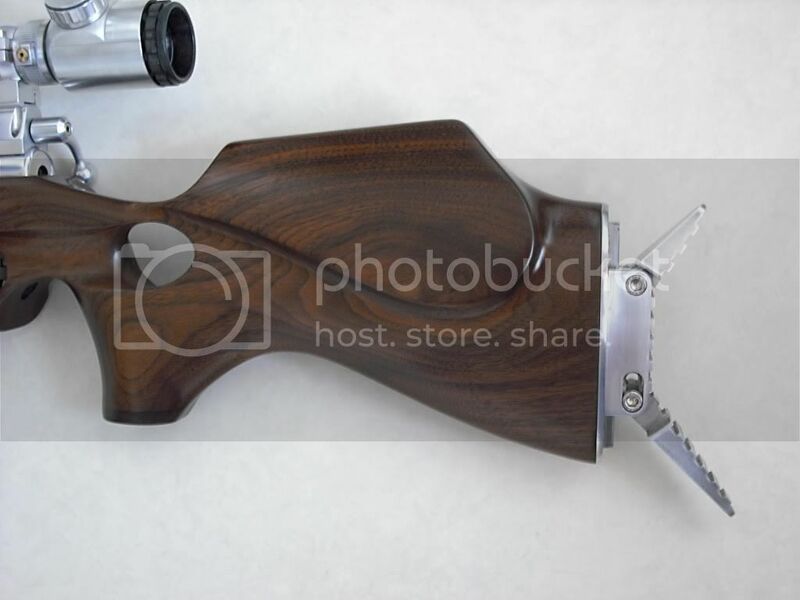 They would be suitable if they were being made for other guns . The first stocks will be made for s400/MPR's although James makes stocks for all sorts of actions . I made a little walnut cap for the ally hamster , took me ages with a hacksaw and remnants of torn sandpaper but I got there in the end . I made an excellent job of it although it was a shame the walnut was as dark as african blackwood ! Oh well it looks better , pics later . You've got to get out of this modesty phase you're going through. Are there actually people out there who don't like me ?